It seems every Halloween season, someone wants to be the new yearly tradition. For several years it was Saw and for six it was Paranormal Activity. Now Blumhouse, creators of the latter series, wants to reclaim the Halloween crown with Happy Death Day, a slasher film that uses time to make it unique and stand out amongst similar films. Does the film succeed in being the new horror movie trend or is it dead on arrival? When it comes to story the first thing that comes to mind is the Bill Murray comedy Groundhog Day. The similarities are so rampant that even the movie itself acknowledges this fact. Our main character Tree is a self absorbed college student who, on her birthday, is murdered by a masked killer. However, she finds that whenever she dies she reverts back to the beginning of her birthday and must find out who her killer is to break the cycle. Despite borrowing it’s main concept Happy Death Day still manages to use it well and come off as fresh and original. The time aspect is utilized well as the film takes the time to establish what is happening early on but doesn’t subject us to the same scenarios over and over again which keeps the film from becoming repetitive and stale. The film also manages to create a sense of urgency as it soon becomes clear that Tree doesn’t have an unlimited amount of lives and she grows increasingly weaker with each death. Unfortunately the time aspect has one major flaw: It’s never explained. There is no explanation as to why Tree reverts to the beginning of her birthday when she dies, it isn’t explained why she only has a certain amount of lives and yes a simple explanation is important otherwise it just doesn’t make sense. Outside of that misstep the other aspects of the story are very well done. One strong aspect of the story I that it plays out like an old slasher film. While there is still a body count the main focus is finding out the identity of the killer. That’s what all old slashers were, good old fashioned “who dunnit?” mysteries and the mystery is well crafted and actually has a decent twist to it. The film also contains a strong sense of humor which is manages to blend very nicely in with the horror aspect. The scenes of comedy are very successful as they are continuingly funny and effective from start to finish. Of course what is a slasher film without it’s kills? The kills themselves are very interesting in that it’s clear that the film was originally shot with an R rating in mind until it was decided to cut it down to a PG-13 rating. Typically when this happens a horror film becomes a confusing, muddled mess and the obvious hacked cuts make for a less engaging and entertaining film. However, here the editing is done very nicely and with a few very well made moments of cinematography to boot the film moves smoothly and still manages to have a fun horror aspect to it. In all honesty blood is not a necessity here and I’m happy for it. Still, the story itself is engaging and humorous enough on it’s own having an interesting aspect that sets it apart from the rest. Tree is one of the most interesting horror characters I’ve seen in quite some time. She starts off as rude, selfish and rather obnoxious. She comes off more as a slasher character who is designed to be antagonistic so that when the killer gets them it’s cathartic. However, it doesn’t take much to sympathize with her plight as she must continually suffer dying day after day with effects catching up with her more and more. Because of this she goes through some very good and gradual character development, looking on herself and her life, how she’s treated others and pushed those she loved the most away. She acknowledges what a bad person she was and makes strides to change that, all while relying on herself to stop her own killer. Carter is Tree’s only ally and gradual love interest and is a pretty good character. He is very helpful to Tree, in more ways than one, and is very selfless and kind. The romance between him and Tree is also quite well made. It’s the same love tropes like in many films but at least from Tree’s perspective she’s had over a week to get to know and are for him. I admit his introduction(s) is rather creepy as Tree continually wakes up hung over in his room. Nothing happened between them but it’s still rather uncomfortable. Even so he’s a good ally to Tree and just a nice character overall, excluding the former incident of course. The Killer might be one of the weaker aspects of the film. One of the main problems is the design. It’s very plain and generic outside of the baby mask which I found to be rather silly and ridiculous rather than scary and memorable. The Killer’s eventual motives themselves are also rather dull, though it seems in slasher films killers do tend to have poor motivations. The best aspect of The Killer is the mystery that surrounds it which does help the film be engaging despite The Killer being blasé. Jessica Rothe does well as Tree, her first leading role. Rothe gives quite a performance as she easily embodies both Tree’s initial cruel personality and her growth into a better person. With so much focus placed solely on her Rothe does a fine job of carrying the film almost completely by herself. She works very well as a final girl type character and I very much would like to see her not only in such a role again but as a lead again. Israel Broussard plays Carter and does a pretty good job. He works well with Rothe both comedically and romantically and though not much attention is placed on him he does manage to be somewhat memorable and enjoyable overall. I don’t know who plays The Killer as every time I look it up I come up with nothing. Whoever it is though does a very good job. It’s a role that doesn’t convey action through words but through movement and actions. The Killer is fast and agile, giving the impression of a vicious and almost maniacally desperate lunatic and the person portraying this character, though one that is rather bland to look at, at least makes the character intimidating and daunting. 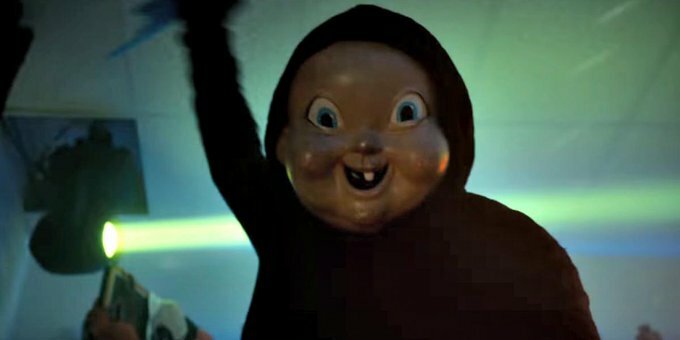 Final Thoughts: Happy Death Day is a fun and creative slasher film. The concept, though not explained, is used well, the humor is outstanding, the kills and editing are very well done, the characters are likable and the acting is done well. I had a lot of fun with this film and I really truly look forward to seeing it again for another Halloween season or two.